South of Beirut, Lebanon is a 68 year old refugee camp housing refugees from Palestine, Syria and Iraq. Many have lived in this camp their entire lives– Mariam AlShaar is one of them. Now, Mariam has pulled the women of this camp together to do what has never been done before. They started with a small kitchen from a micro-loan. With nearly insurmountable political odds against them– they look to start the first refugee food truck. Their journey is one of many ups and downs but it is the community that is built, their sense of hope and how they see themselves that makes this a moving, touching film about their journey. Mariam has been known as ‘the crazy lady’ and now she will show just how crazy she is. KIDS FIRST! Film Critic Ella L, comments, “. 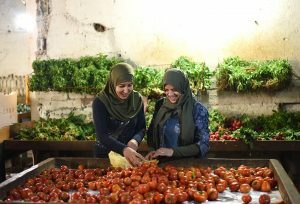 I felt so connected with the women in this film and was really intrigued by their stories, as well as what they have to say. This is an incredible film in so many ways.” Kimberly M., KIDS FIRST! 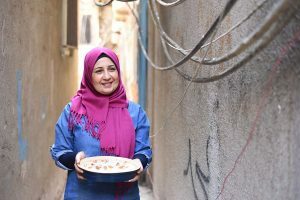 Adult Juror adds, “This documentary is about one woman’s quest to start a food-truck business in the refugee camp where she resides, in Lebanon. Mariam Shaar, with her adept business sense and entrepreneurial spirit sets out to improve the quality of life for herself and those around her.” See their full reviews below. 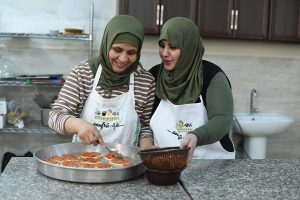 The fil mmaker follows a group of women in a Lebanese refugee camp who enjoy and have a passion for cooking. 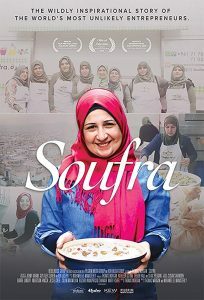 They are hired by a fellow refugee, named Mariam, to start a catering company called Soufra. The film documents the struggles of these women being unable to purchase a food truck for their business. Even though they raise the money to purchase it, thanks to a Kickstarter campaign, it is still difficult for them to get the proper permits to own the truck, due to local laws. What really intrigued me initially, was the beginning scene in the kitchen. It is so lively, entertaining and captivating. The introduction to a film is so important. The rest of the film is equally well shot. The camera quality is clear and the cinematography is pretty spot on. This film really is quite entertaining and educating at the same time. I thoroughly enjoyed watching it because every aspect is so incredible. The messages the film promotes are completely pure and positive. These women deal with really tough situations and lead extremely tough lives. However, they manage to stay strong and powerful regardless. The message is about never giving up or quitting, even when it feels like the entire world is telling you to. Never lose sight of your goals. I recommend this for ages 10 to 18, as well as adults and give it 5 out of 5 stars. I am so impressed with the women in this film and everything they have accomplished. I admire them all very much. This is a film that is truly incredible and one I will remember for years to come. After David Kim (John Cho)’s 16-year-old daughter goes missing, a local investigation is opened and a detective is assigned to the case. 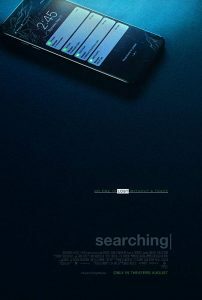 But 37 hours later and without a single lead, David decides to search the one place no one has looked yet, where all secrets are kept today: his daughter’s laptop. In a hyper-modern thriller told via the technology devices we use every day to communicate, David must trace his daughter’s digital footprints before she disappears forever. KIDS FIRST! Film Critic Alejandra G. comments, “This new drama/thriller grabbed my attention since the beginning, because of its amazing and unique storyline. I felt thrilled to discover what would happen at the end and, whether or not the outcome would be what I expected.” See her full comments below. The storyline is about a father, David, that enjoys watching his daughter Margot grow up while posting pictures and videos of her to social media, sharing his happiness with his love ones. As Margot enters her teenage years, she starts to grow apart and seem distant from him. One day, she disappears after telling her father that she went to a study group. David looks on the internet to try to find clues about where she may be. Her friends don’t seem to know much and don’t help either David or the detective that comes on the case to figure out what happened to her and hopefully find her alive. My favorite scene is when David starts to get desperate because of Margot’s disappearance, leading to him brainstorming ideas about how to find her. This results with him going into Margot’s computer to find answers as to whereabouts. This is my favorite scene because it is very meaningful and is the moment he starts to realize, although he doesn’t admit it, that he truly does not know his daughter at all. When he opens her laptop, it is as if he is entering unknown territory and we see the distance between him and Margot. He was very close to her, while she was growing up, but as soon as she hit the teenage years, she became a stranger. The important message in this film is that better communication between family members is encouraged and will improve the dynamics of the family. For example, in the beginning of the movie, the reason for her disappearance is unknown and that leads to the suspense and mystery of the storyline. But, let’s say hypothetically that Margot disappeared on purpose, because she was dealing with a problem and, since she had grown apart from her dad, she didn’t feel he could help her. If parents, especially those raising their children alone, communicate and interact better, they can help their kids through the tough times. They ease the process of going through conflicts, so that running away is not their only choice. I recommend this film for ages 13 to 18, as well as adults and I rate it 4.5 out of 5 stars. It opens in theaters August, 31, 2018 so, check it out. 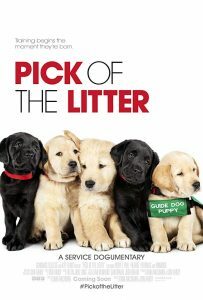 Pick of the Litter follows a litter of puppies from the moment they’re born and begin their quest to become Guide Dogs for the Blind, the ultimate canine career. Cameras follow these pups through a two-year odyssey as they train to become dogs whose ultimate responsibility is to protect their blind partners from harm. Along the way, the dogs meet a community of dedicated individuals who train them to do amazing, life-changing things in the service of their human. The stakes are high and not every dog can make the cut. Only the best of the best. The pick of the litter. KIDS FIRST! Film Critic Dariana A. comments, “It’s a great family movie with all of the cute dogs. Pick of the Litter follows such a sweet storyline that you just fall in love with all of the dogs and their journey through many different homes.” See her full review below. Pick of the Litter is such an adorable movie. It has an amazing topic that not many people know about, so you are not bored. It’s a great family movie with all of the cute dogs. Pick of the Litter follows such a sweet storyline that you just fall in love with all of the dogs and their journey through many different homes. 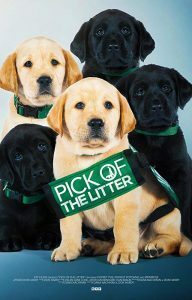 Pick of the Litter follows a litter of puppies from the moment they are born through their j ourney to become Guide Dogs for the Blind. The “P” litter has to go through two years of training with many different owners to train them on their journey to become Guide Dogs. But only the pick of the litter will get the chance to become Guide Dogs. This documentary is such a feel good movie. There are some moments that bring tears to your eyes. 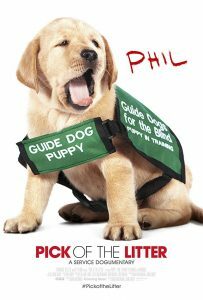 When my family and I watched the movie, it was fun for us to guess which dogs would pass the tests and become Guide Dogs. All the dogs are so cute and the relationships the dogs go through with their trainers and finally when they get paired with their official owners, is very emotional. The five dogs in the litter are Patriot, Potomac, Phil, Primrose and Poppet. All the dogs have such unique personalities. My favorite out would have to be Patriot because he has a lot of different trainers and he has so much energy. He has the biggest personality. He also ends up with such a sweet family and really helps the family he’s with. The movie has so much for people of all ages. The charming dogs are enjoyable for everyone and the story they te ll is delightful and sends a great message. The message The Pick of the Litter sends is that dogs go through a lot of work to become Guide Dogs and, even if they don’t become one, they still bring joy to whomever owns them. I recommend this film for ages 8 to 17. 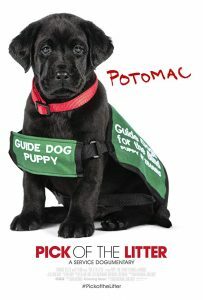 There is so much to learn about the training Guide Dogs go through and this film has lots of things for kids to learn. I give it 5 out of 5 stars, because it has such a great topic and the dogs are super adorable. You can find this film in a theater near you on August 31, 2018 so, check it out! The Adventure Continues. The arrival of the super powerful Meicoomon starts a countdown to the real world’s collapse. 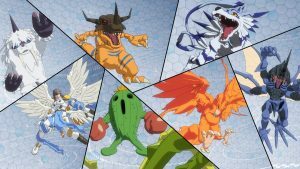 The Digi-Destined are cast out of the Digital World, and even after returning to the real world, are driven away by people, due to their partnerships with the Digimon. Meanwhile, a cruel fate appears imminent for Kari, who has a more honest and sensitive spirit than anyone. KIDS FIRST! 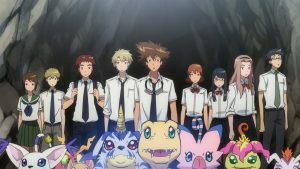 Adult Juror Kimbirly M. comments, “With the well-known Japanese anime style, Digimon-tri has sharp-edge graphics and action sequences that draw the viewers in.” See the rest of her review below. 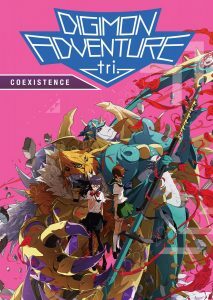 This is a continuation of the popular Digimon-tri series. The storyline, gener ally about dark forces taking over, flows well. There are no lagging sequences that would bore the viewer. One becomes empathetic with the protagonist Kari and even the evil force overtaking Meicoomon. The vocabulary and concepts are appropriate for its intended age group and could further enhance vocabulary and concepts that the viewer may not understand. It portrays pro-social models such as when Kari feels that she might be responsible for a specific situation and one of the others reassures her that this definitely isn’t the case. This entire series is very good at displaying consequences of both negative and positive behaviors. There are also good models of problem solving such as when a Digimon character decides on an action and another vehemently opposes it. The rest of the group has to come to a general consensus to make a final determination. 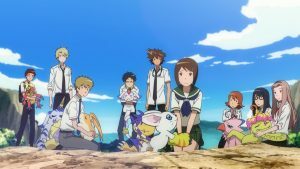 Posted in DVDs Released | Comments Off on Digimon Adventure Tri: Coexistence – Graphics and Action that Draw You In! You are currently browsing the KIDS FIRST! News weblog archives for September, 2018.